This dessert recipe, like many of my grilling recipes, is a celebration of summer. Though the production is a bit complex, the flavors are simple, straight forward, and manage to highlight one of our favorite summer foods: strawberries. Ripe summer strawberries are a treat. Indescribably delicious, you cannot go through a summer season without featuring them at least once (unless you’re allergic, which is a different story). And, of course, strawberries are also quite versatile. They work as a breakfast item, as a dessert item, as a savory item (think arugula salad with parmesan, balsamic and strawberries), as a side, as a featured ingredient, as a puree, in drinks and cocktails, and so on. 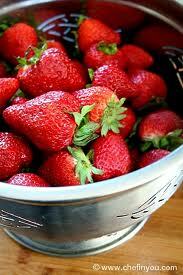 Agricultural areas (like those just outside LA) have festivals celebrating the strawberry season. I could go on, but let’s face it, strawberries are just an amazing ingredient. Strawberry shortcake is almost a perfect showcase for an already great ingredient. In restaurants (especially fine dining), strawberry shortcake remains a top seller. Chefs can be very artistic and fancy with the presentation, adding little dollops of purees and fancy tuilles and contrast points, some make them like actual cakes, some make them into individual cupcakes, other make them like trifles and present them in martini glasses (very impressive! ), but the premise remains the same: Some sort of shortbread or basic cake, macerated strawberries, and whipped cream. 3 things: perfection. A few words about the actual production: I personally like to use angel food cake. I like the flavor and texture, and very importantly, it’s neutral enough to not overpower the strawberries. You can very easily use vanilla pound cake, or genuine sugar/vanilla shortbread or biscuits. When in a hurry, it might be easier to buy the cake, and save yourself the work, but that would negate the point of posting a recipe. Angel food cake is not altogether easy to make. Essentially, it’s a meringue based confection (or a sponge cake). If you’re comfortable making and working with meringues, this will be no problem. If not, you will face two challenges: First, creating the meringue (whipping the egg whites with sugar until soft peaks form). Second, not deflating the meringue when you add and mix in the flour. My advice is to read through the instructions twice, consult youtube for lessons, and take your time and go slow. In the end, you will find it’s quite easy. Bring your oven to 350. Put the sugar in a blender or food processor and process until superfine. Shift the flour with half the sugar and the salt. Reserve the remaining sugar. In a stand mixer fitted with a whip attachment, place the egg whites, water and egg whites and begin whipping. Begin slowly adding the reserved sugar. Add the sugar little at a time, and continue to run the machine at medium speed. Whip until medium peaks have formed. Add about 1/4 of the flour mix and slowly run the machine to incorporate. Slowly add the rest of the flour mix and run the machine on slow until everything is just barely incorporated. Overworking with deflate the egg whites. Spoon the mix into ungreased tube or loaf pans. Bake for about 35-40 minutes, or until a toothpick comes out clean. Turn out onto a resting rack and let cool completely. Mix everything together and refrigerate for about 1 hour. Place the cream in a stand mixer fitter with a whip attachment. Run the machine at medium high speed, adding the sugar little at a time. Add the vanilla extract. Whip until full volume. Transfer to a storage container and reserve until ready to use. Slice the cake into 1 inch pieces. Spoon the strawberries and their juice over the cake, and top with a large spoonful of whipped cream. You may garnish with a sprig of mint or a dusted of confectioner’s sugar.